Survey finds people are concerned about cybersecurity, interested in learning more - Network Performance Inc.
BURLINGTON, Vt. (WCAX) Tens of thousands of cyber-attacks reportedly happen everyday, a scary reality for the many of us who shop online and surf the web. Champlain College Online surveyed over 1,000 people to figure out what they know about cybersecurity and how much they think it impacts them. The survey overwhelmingly suggests people are interested in learning and most are even willing to be formally educated in it. The survey found 88 percent of people surveyed expressed real concerns about cybersecurity. “We found that when you break that down the older people were the more, the more they were concerned about cybersecurity threats,” Chair Cybersecurity Programs, Kathleen Hyde said. That same survey said, people 54 to 72 were “very concerned” about the issue. However, people ages 20 to 37 were less likely to be concerned about a potential threat. That demographic showed just around 30 percent of people were concerned of a threat. While people showed varying levels of concern over the issue, the survey did find it’s a topic people are very interested in. 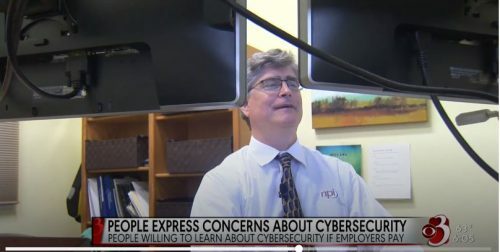 “A vast number of the respondents said they would be very likely to pursue education in cybersecurity if their employers were to assist them in paying for their education,” Hyde said. That’s where Eric Hart CEO of NPI comes in. He runs a tech management firm and he says there are a lot of jobs for people who are interested in cybersecurity, including, here in Vermont. “In Vermont, there are certainly some of those high-profile forensics jobs, the state police, a few of the financial services firms, some of the municipalities have some specialized training around forensics,” CEO of NPI, Eric Hart said. He says those don’t make the bulk of the jobs. In fact, most jobs are going to be in some kind of prevention field where cybersecurity is not the main role. “Network administrators, people who would administer networks and are responsible from keeping the public and private data separate, that those people have a cybersecurity component to their job,” Hart said. As for Hyde, she wants to use this survey as an opportunity to let employers know they have a pool of potential workers. “The survey shows that there is talent within organizations they just need to be “found” and then educated so they can come into the field,” Hyde said. Moving forward, both Hyde and Hart would like employers in Vermont and around the region to explore ways to train their current employees for a job in cybersecurity.